All visuals (excluding tables and musical scores) are labeled Figure or Fig. followed by a Arabic numeral (e.g., Fig. 1). If you provide source information within captions, you do not need to include the same source information in the Works-Cited Page. 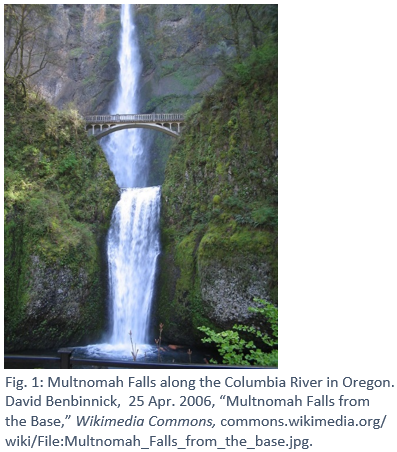 Below the visual, provide the label and number (e.g., Fig. 1), followed by the caption with source information in note form. First Name Last Name, Day Month Year, "Image Title," Title of Container (e.g., website), location (e.g., url). Provide citations on slides where image is displayed. 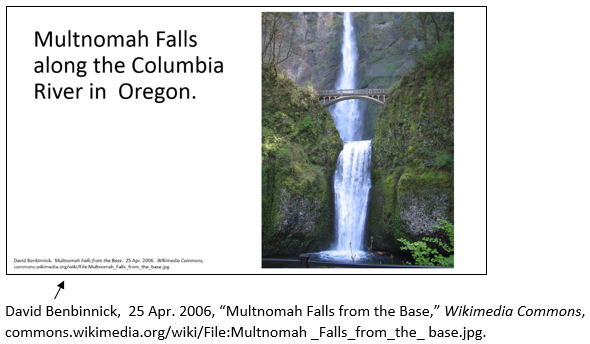 One popular natural attraction in the Portland, Oregon area is Multnomah Falls (see fig. 1).